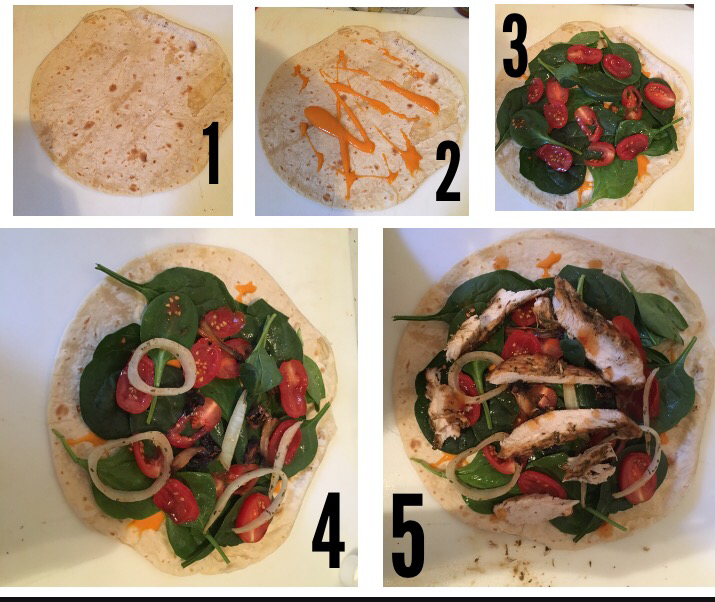 Today I am sharing something soo healthy, delicious and easy to put together. So what’s new? I’ve recently increased my water intake because I just needed to. If you read my post about bentonite clay, you’ll know I drink clay with water for detox and cleansing purposes. I want to take care of my insides and teach those around me the importance of caring for their insides. Hey, click the link and check it out! 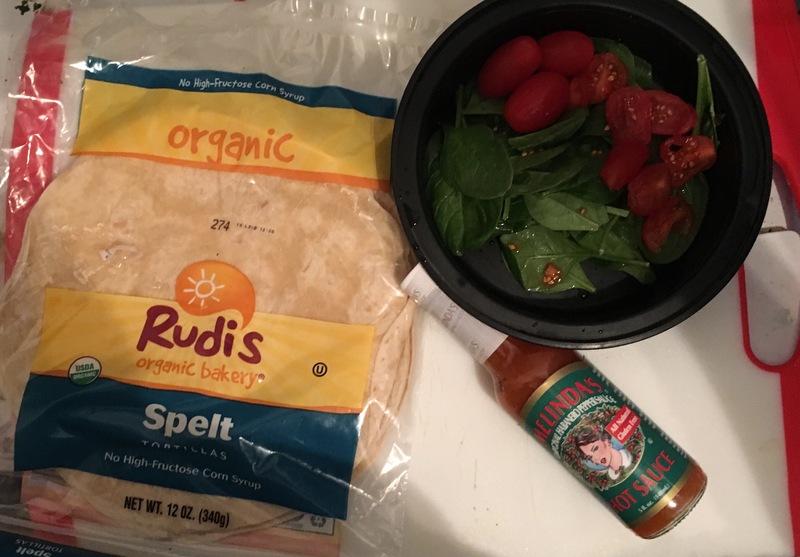 On to my new discovery…but I’m sure you know what it is, cause you’ve read the title! (Disclaimer: I am not stating that I’m the founder but yes, I discovered it for myself😋). Who knew a bottle of this yumminess could be filled with these amazing benefits? Cause I didn’t know, but now I do. I began drinking strawberry water mostly because it tasted so yummy and strawberries can sometimes be too sweet to munch on alone. So I threw them into my water. Within a couple of minutes, the juices are released into the water. The longer their infused, the more potent the sweet taste is. I did notice that I burned fat & became leaner. That’s one of the best things that could happen! Oh yes it is! 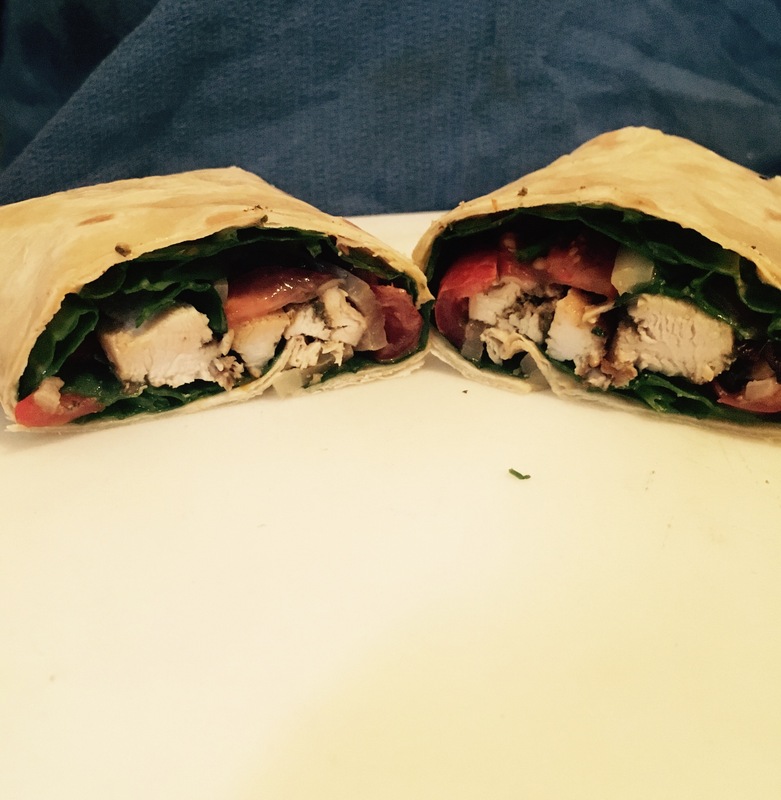 I also noticed my metabolism was slowing down and I felt lighter… you know like my 15 year old self, no kidding! I also found that it quenched my thirst! How satisfying! 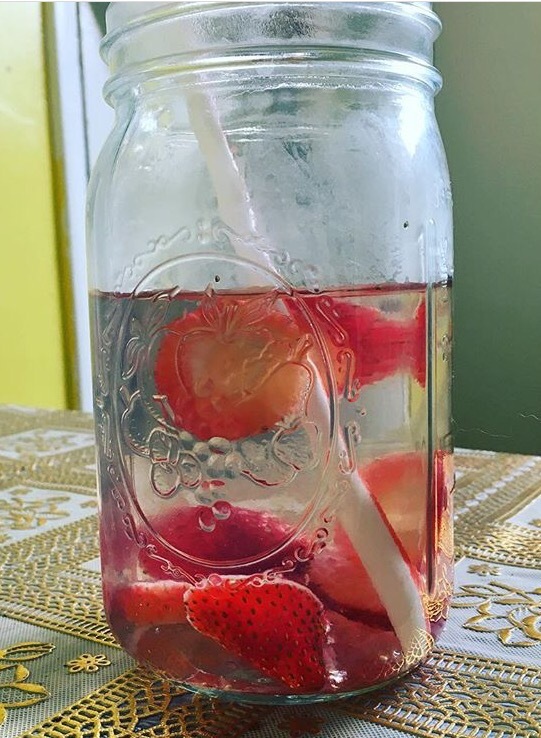 If you’re interested in increasing your water intake, losing weight, gaining muscle, or a simple detox, try strawberry water! You’ll feel lighter and look forward to drinking it everyday lol. You’ll even go to bed early so you can have it again the next day. Oh, if you’re fancy, try it with sparkling water. Let me know if you have tried this water or if you will! Or share other yummy infused waters to try along with their benefits. So when I got a notification about this blog, I didn’t think little old I would be nominated. But shout out to this cool sister at JusTalkBlogs (and please do check out her amazing blog!) for nominating me. I have the urge to give a speech, but I won’t go there lol. And of course thanks to Okoto Enigma for being so creative and fun! Check out her blog as well. I am the youngest and only girl of four. I enjoy singing along when my fiancee plays his instruments. I collect journals for brain dumps/ideas, prayer entries and bullet journel/bujo because they’re pretty and full of empty space that can become almost anything! If your life was a book, what would this chapter be called? “Happy, Go Lucky” cause I wasn’t always a smiler, especially not in New York. Sadly, no one has time to crack a smile. Nowadays I catch myself smiling naturally and smiling to myself lol. What is your motivation/inspiration? My motivation is my fiancee! We share our goals with each other and hold each other accountable. I can’t let myself down and neither do I want to let him down. What’s the best book or movie you’ve read/seen? Recently, I’ve been hooked on War Room (save it and watch it!) because it’s a great lesson on the importance of prayer in one’s life and how much the enemy is really seeking to kill, steal and destroy. Heads up, the cries are so fake! What’s the best thing you learned from 2016? The best thing I learned about myself in 2016 was how negative my mindset was and still is. I learned that I cannot be surprised about my sometimes crazy thoughts but rather be active in positive thinking and becoming better, hence my blog’s name! What is one song that you’re embarrassed to admit you like? Oh my lol. I am greatly into Hakuna Matata from the Lion King. I mean it means no worries (sings) for the rest of your dayssss! It’s our problem free philosophyyy, Hakuna Matata! What is the best complement you can give yourself right now? What is one goal you’re focused on this year? Whats your go to hobby? Some time ago, two sisters shared with me the amazing use of Bentonite Clay for the internal body. After hearing their testimony with bentonite clay I went ahead and ordered 5 lbs of sodium bentonite clay (here’s where I purchased it). 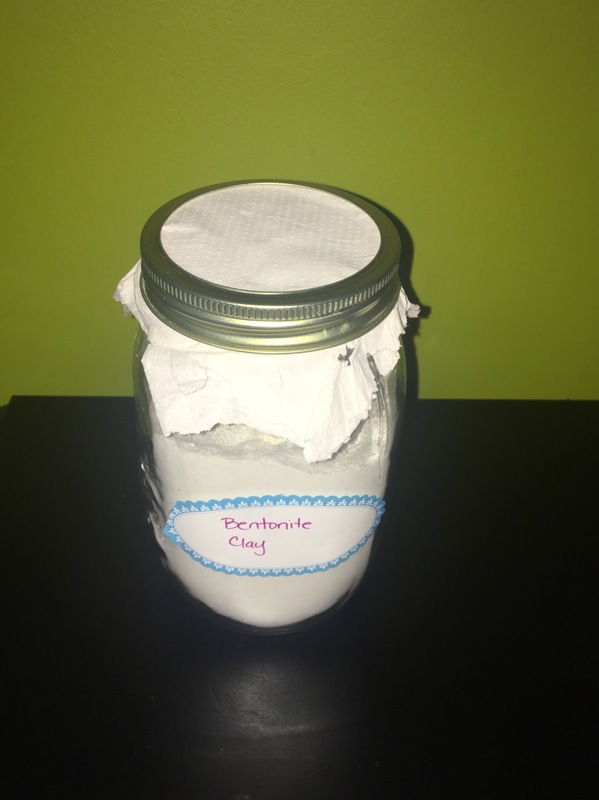 I would like to share what bentonite clay is, what is does and what it can be used for. Being a daughter of the King, I am big on using what He has made to heal, cleanse and bless us. Nature itself. Drink clay? Ohh yeah! Drinking clay daily detoxes and cleanses the organs from their impurities. (Hint: don’t drink it for the taste, drink it for your health and cause you love you!) Drinking clay is also an awesome route to clearing the skin from scars and acne. While the organs are being cleansed and remember, our skin is our BIGGEST organ). As mentioned earlier, bentonite clay plays as a magnet. Let me say this, it does not discrimminate and pulls at everything. So for example, if you take a spoon of bentonite clay with a metal spoon, it will pull from the metal and BOOM– just like that you’re clay can be contaminated and filled with metal. That is why I store my clay either in the bag it came in, or in the glass mason jar below with a paper towel as a lid. I also use a plastic/wood tablespoon .to measure how much I want to use. I am not educated in any other way you can store it, but if you do know of any other way, please feel free to teach me! I’d love to learn more. Overall, I think everyone should have at least a bottle of clay in their homes for any emergency uses. You just never know! Bentonite clay has and is helping my body out in so many ways. You just can’t go wrong with it. To begin, you’ll need a spray bottle that will allow you to control the mist control. 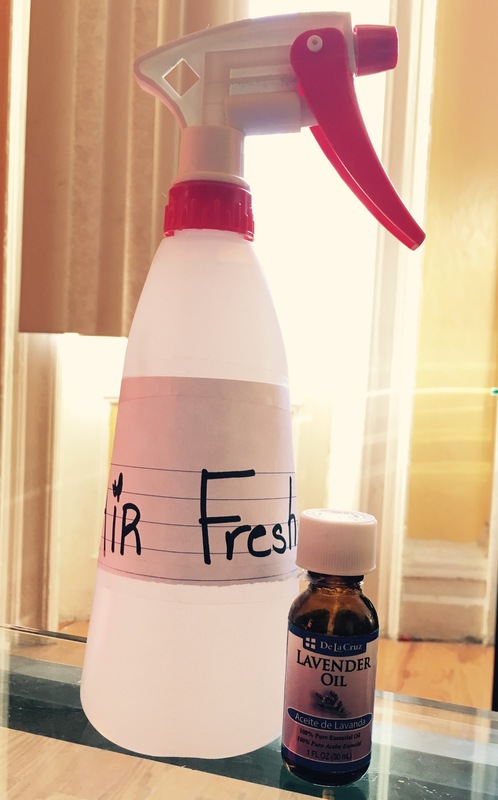 This will determine how you would like the air freshener to disperse from your bottle. Be sure to grab your measuring cups (a cup and 1/4 cup)! 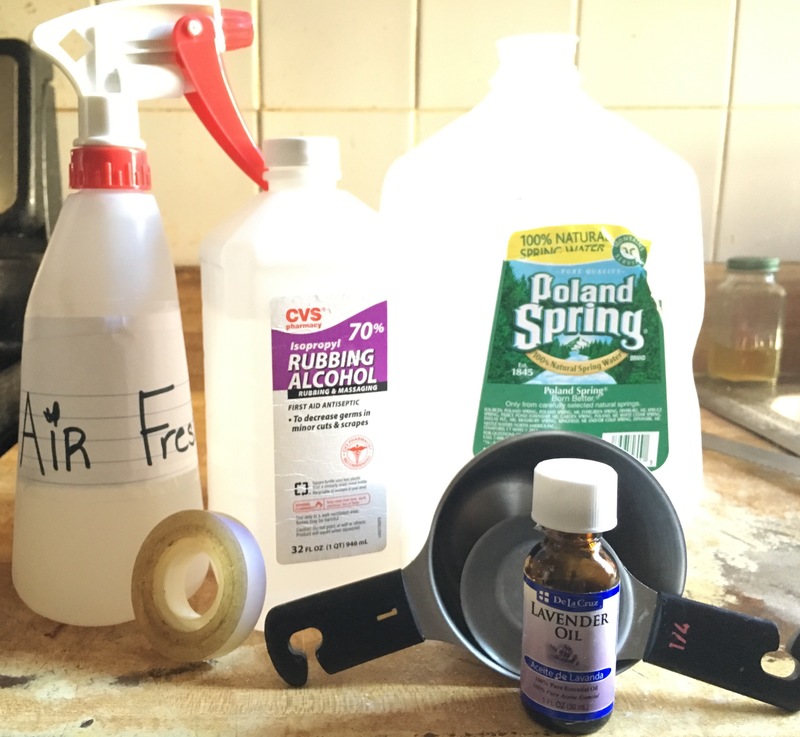 For every cup of water you pour into the bottle, pour 1/4 cup of rubbing alcohol and 15 drops of your essential oil. Follow these steps until you fill your bottle to your desired capacity. Label your bottle so you know from first hand what’s in there! Test it out!l especially after getting some cleaning done sis! Some essential oils that would smell great are: peppermint oil, orange oil, rose oil, sweet almond oil and lemon oil! I like to slice the breast so that the seasoning can get in well but that’s me! Squeeze in lemon juice and apple cider vinegar (ACV) to clean the breast. Let the lemon juice and ACV sit in the chicken breast. When the water boils, pour out the lemon juice and ACV and pour the boil water on to the chicken breast. 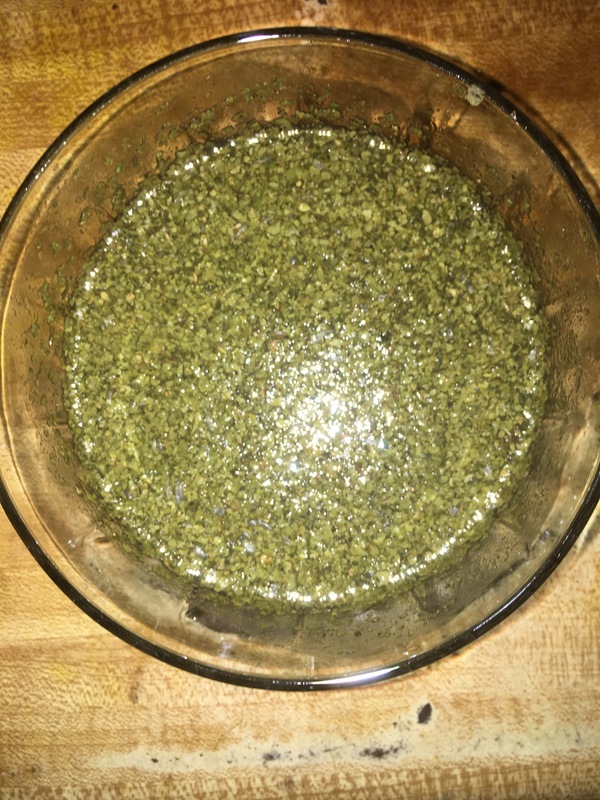 Pour out the liquid and throw/rub on your seasoning. And I decided to add in my onions and mushrooms that were in the oven. 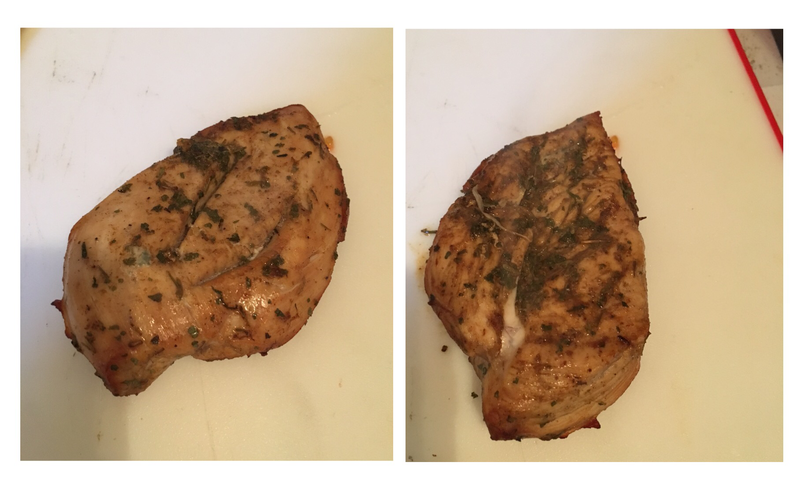 I vertically sliced the chicken breast and laid it on top. After, I added a desirable amount of hot sauce. This took me at least an hour to get done. 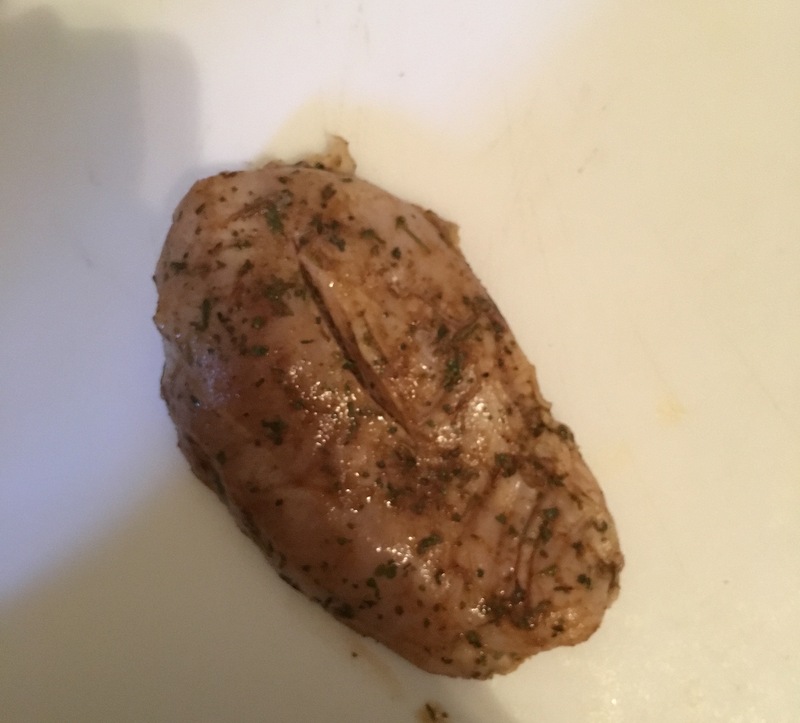 The chicken was clean and marinated with seasoning the night before. Hey there sisters!! 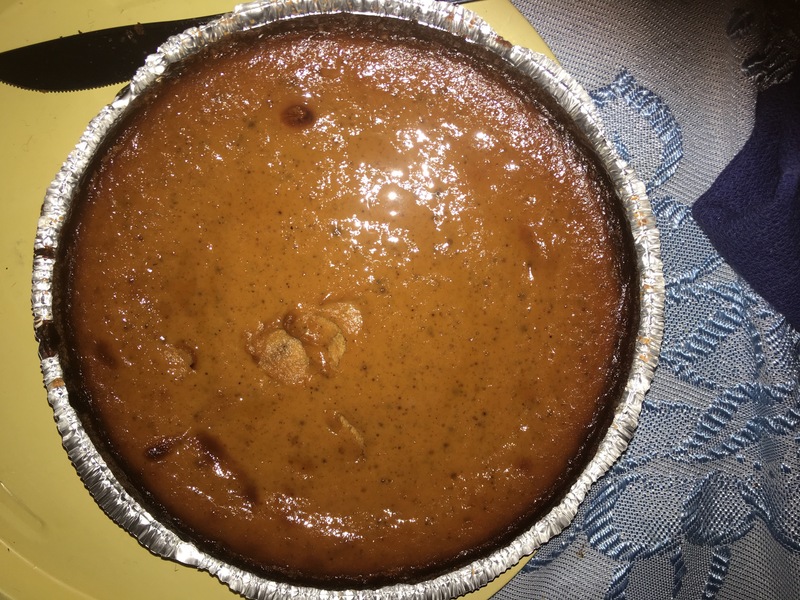 As promised on Instagram (@abetterwomancafe), it’s Sunday and my pumpkin pie recipe is up for my foodies!! Preheat the oven at 425 degrees for 15 minutes. 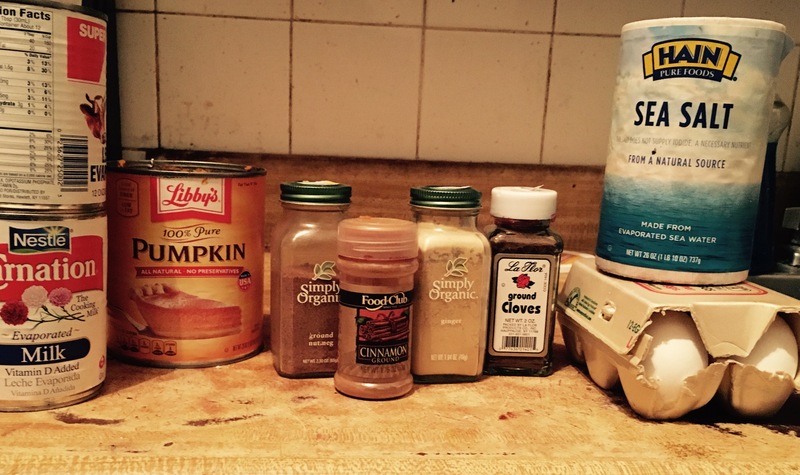 Mix the eggs, milk, ground cloves, brown sugar, sea salt, ginger, cinnamon, nutmeg and pumpkin into one large bowl. Mix until it is smooth in texture. After 15 minutes, put the oven on 325 degrees. Pour mixture into two pie crust. Place in oven until mixture is golden. To test: poke a knife at the middle of the pie to see if the knife will have pumpkin reside. Once you past the test, leave pie out to cool off. In becoming a better woman, it’s important that we become better at our future roles as a wife to our husband and a mother to our child(ren). And though the American society doesn’t believe it, cooking is a woman’s role in the Bible. Proof? Side note: if you disagree, take it up with God in prayer sister. 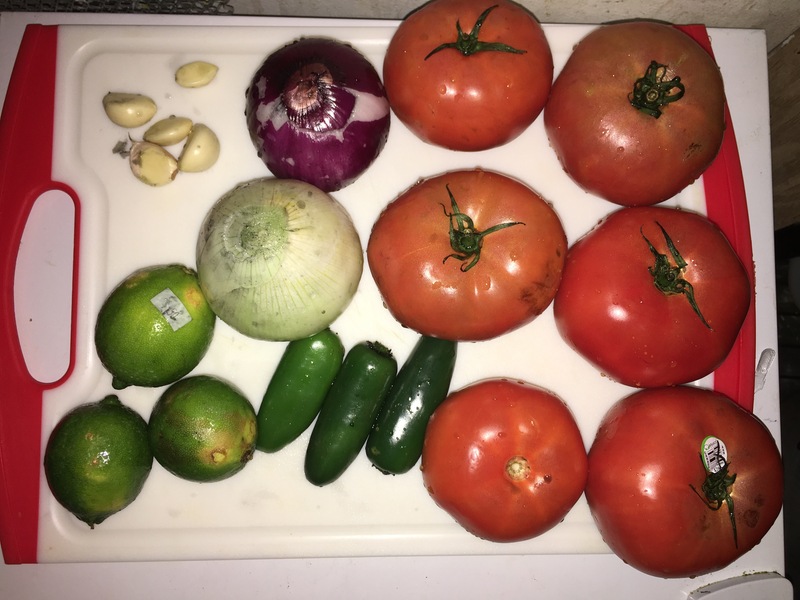 So today, I learned to make salsa from scratch. Yes ma’am. Above photo: so I squeezed the 3 limes and got lime juice. I added 1 tsp of cumin, 1 “cup” (not accurate measurement) of cilantro and 1 tbsp of chili pepper. 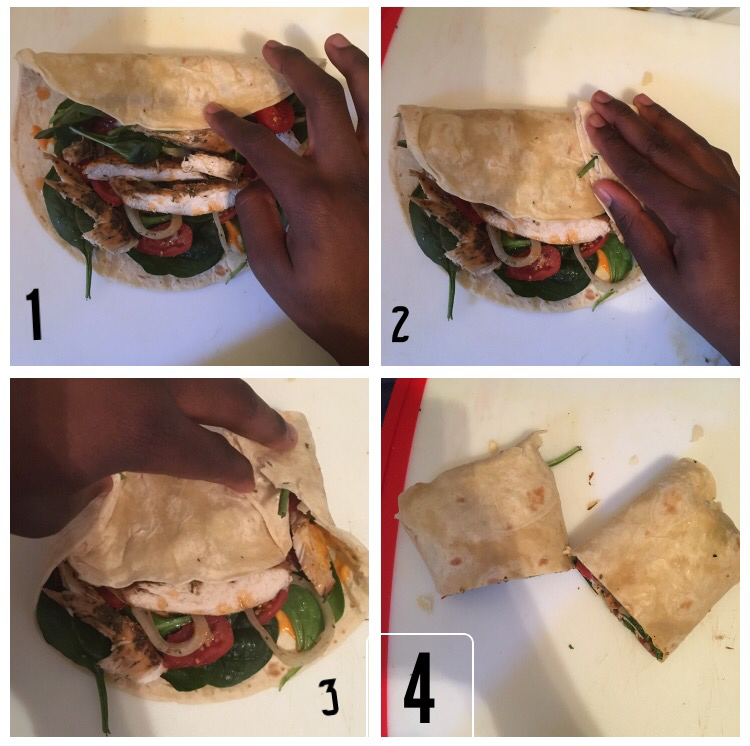 Cut all the ingredients to desired size. Use food processor if you want to get the produce really small. I made my own chunky but wish I chopped up my onions a bit smaller. 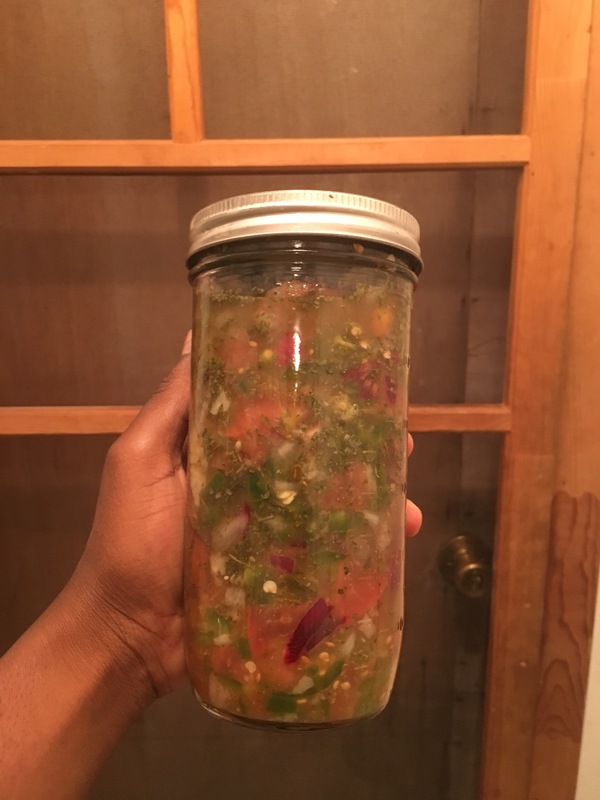 Pour all the ingredients together into a jar and let it sit in the fridge. I prepared rice, turkey meatballs, salad, plaintains and added salsa on top of my dish: Delicioso!